Recently I’ve wondered if there is anything I could do to improve the quality of that personal time I spend with each of the teens on my camps. Well, I found something! This blog post is about a simple tool that helps teens reflect on a theme, deepen their understanding of that theme, and then channel their questions and experiences in a logical and progressive way. What is “Personal Mentoring”, or “Discipleship”? Effective youth ministry requires one-on-one discipleship, or personal mentoring. Gone are the days when we consider it successful simply to create large events with hundreds of teens. Statistics show these are not enough. Why? Though these are powerful and unforgettable experiences, our youth ministry also requires a complementary person-centered approach that is able to respond to the specific questions and needs of each individual. This is indispensable for teens to develop a deep relationship with Christ and properly discern their calling in the Church. 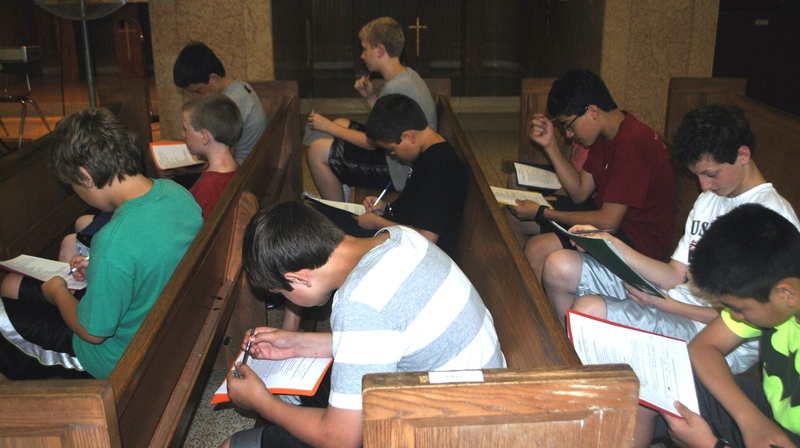 Following the “ECyD Method” (Experiences, Convictions, your Decisions) that I use and have expounded upon in other blog posts, I’ve always sought to spend quality time speaking with each of the teens on my camps. In a nutshell, it’s a way to personally address each teen’s experience of family, friends, school and faith, and to see if there is any encouragement or help I could offer, always under the guidance and inspiration of the Holy Spirit. Naturally open and talkative teens would hardly move beyond superficial topics and often found it hard to focus. Naturally shy or reserved teens didn’t know what to say, or at times didn’t find the courage to open their hearts. 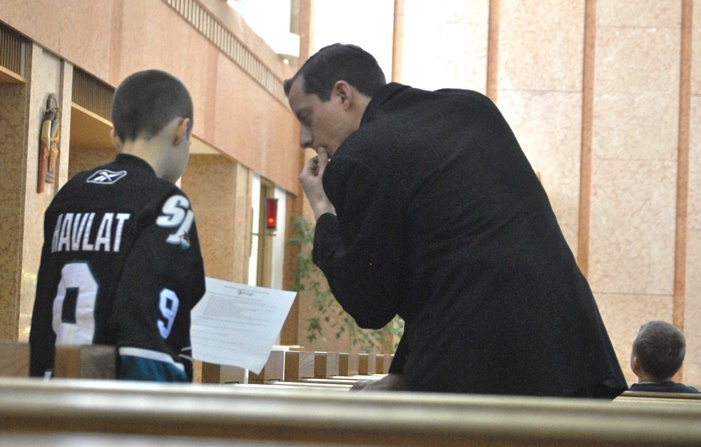 Few teens actually enjoy and seek after talking with a priest or seminarian. There are other fun things to do at camp. It’s also a little intimidating, especially if they don’t know you well. And sometimes they would think they were in trouble! Even if we sparked a good conversation, it had little to do with the camp’s theme, or perhaps we didn’t know what direction to take the conversation. There may not have been a sense of accomplishing something and learning something new. Sometimes the adult mentors talked way too much, and eventually monopolized the conversation. There may have been other difficulties, and I am also excluding how to develop trust beforehand. Yet, even with a little bit of trust, this method seemed to improve the quality of our conversation. I found a series of books by Youth Specialties (www.youthspecialties.com) called “Talksheets”. Each book contained all kinds of talksheets for middle schoolers and high schoolers. The talksheets are themed handouts each with a mixture of questions, multiple choice answers, fill in the blanks, and other gimmicks, arranged in such a way that it helps the teen reflect on the theme and think about himself and his experience in light of that theme. According to the book, the talksheets are filled out individually, and then used to help guide and animate group discussions. But I thought they could also be used for personal mentoring. So I gave it a shot! Then I included time in the schedule for the teens to fill out their talksheets. 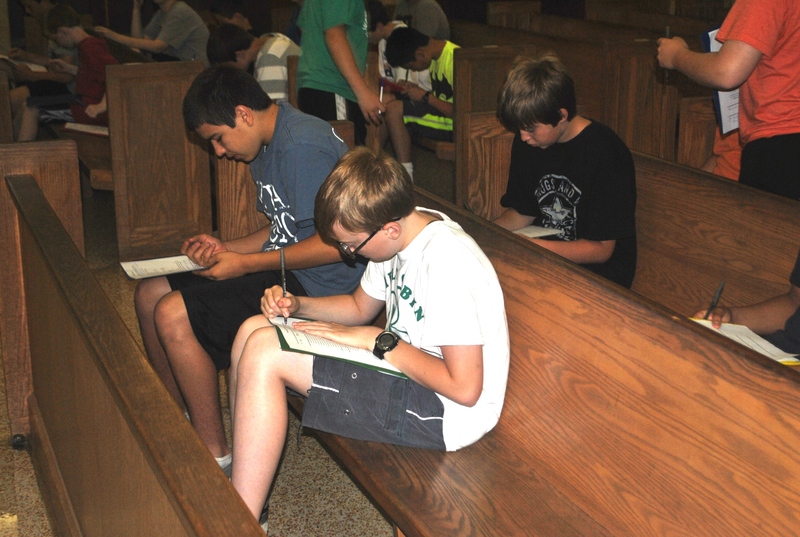 I decided that after breakfast, every day, we would all go to the chapel where everyone would have as much time as they needed to fill out their own talksheet. The first night before the first morning, I explained what the talksheets were for, how and when to fill them out, and how they would benefit them. I gave each teen their own folder to collect the talksheets, and as they entered the chapel they would pick up that day’s talksheet. I was in the back of the group in case they had questions, which they sometimes did. When it came time for personal mentoring, I would ask each one to get their folder and we would walk around talking about the talksheets they had filled out. Wow! The results were immediately surprising, time and time again! Naturally open and talkative teens were very focused, and would easily move to a deeper level in the theme. Naturally shy or reserved teens knew exactly what to say, and how to express it. It seemed like they just needed little “sparks” to allow their ideas to flow. Each gimmick in the talksheets were just those needed sparks. Even teens that I didn’t know well would share the answers to their talksheets without any apparent issues. Each gimmick would easily spark a good conversation. I simply had to ask them “why did you write this?” and sometimes all kinds of reasons and answers would follow, upon which I could build a conversation. Some teens seemed to enjoy going through the talksheet, telling me with much detail and precision why they wrote down specific answers. It seemed like many of them felt proud of their answers, most especially when they were correct! They felt a sense of accomplishment after going through the whole talksheet. It was apparent when they were learning something new, because they either missed it on the talksheet or they got something wrong. It was so impressive for me to witness 11 -15 year old teens talking to me about a specific theme, without losing focus, without substantial intervention on my part, and for up to 30 minutes or more! As an adult mentor, the talksheets helped me better discern what I needed to talk to each teen about. It was easier to notice gaps in their understanding or areas they needed to develop. At the end of the camp, I asked a whole group of teens what they thought of the talksheets. They all liked them. They said it gave them something to talk about. It also gave them a sense of accomplishment and of learning something new. This is very important for teens. I asked them if they would prefer to keep using the talksheets or to go back to spontaneous conversation, and they immediately asked to please continue using the talksheets. For me, that’s a success! Parents: I think parents could use these to encourage dialogue with their own teen children. Group Discussions: These could also be used to create group discussions, which is actually the reason why Youth Specialties created these talksheets. School: You can use these in the classroom, for teachers and mentors to create group discussions. CCD: You can use guidesheets to create discussions about specific themes covered in CCD. Meetings and Retreats: You don’t have to wait until camp to use these. You can use them for a youth group meeting or during a retreat. A Team-Building Chant: Man of God, Rise Up! Posted in Youth Ministry 101Tagged a featured page, activity, adolescence, christian prayer, discipleship, ECyD, encounter God, faith formation, formative activity, group activity, group discussion, guidesheets, mentoring, new architects, resource, retreats, talksheets, teaching teens to pray, teens, youth mentoring, youth mentors, youth ministryBookmark the permalink.